When buying a spit roast pig from us you are welcome to loan our spit free of charge* - prebooking essential. Contact us today. 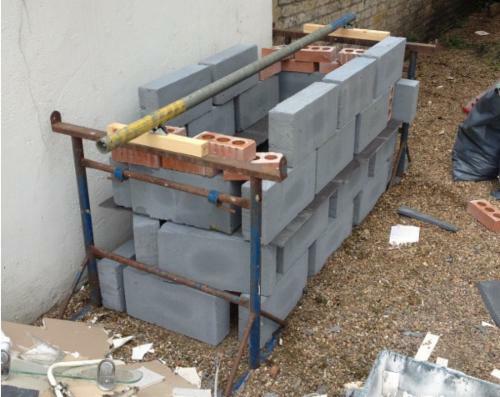 Whilst building your fire pit is fairly simple - a hole in the ground, or a few bricks/blocks, or perhaps use a large barbeque or oil drum, a home made spit is a little more involved. You need something that will take the weight of the pig, and secure the pig to enable you to turn it to cook it evenly. Many people make the mistake of using a scaffold pole which is rather large and near on impossible to insert through a pig. Our stainless steel spit with skewer spikes makes the job simple and will take up to an 80kg hog. The spit can be rested on a simple frame, builders tressles, a pile of blocks, or you can get as imaginative as you wish. The end of the spit is drilled for a bolt so can be connected to your turning mechanism, be it manual or electric. * £120 Deposit required, spit must be returned in good time in good order for the next weekends loan, ideally shipped to us on the Monday for delivery Tuesday. Parcel Force are a courier we regularly use. Please insure the full value if you do not wish to take the risk in case of loss/damage in transit.